The South Carolina Department of Health And Environmental Control (SC DHEC) mandates that every public water system must initiate and maintain a viable cross connection control program. 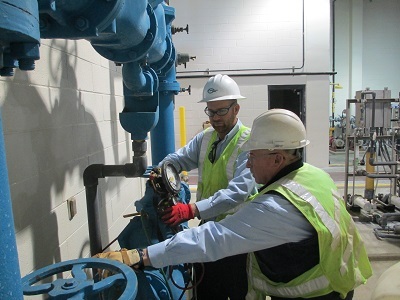 Spartanburg Water began a Cross Connection Control/Backflow Program in the early 1980’s to ensure that our customers have safe, clean drinking water that meets or exceeds all regulatory requirements. What Exactly is "Cross Connection" and "Backflow"? A cross connection is defined as any piping arrangement that allows the drinking water supply piping to be connected to a non-potable water source. A backflow is any undesirable reversal of flow from the intended direction as the result of either: back siphonage (the reversal of flow due to negative piping pressures) or back pressure (the reversal of flow caused by pressure greater than the supply pressure). The Cross Connection/Backflow Program at Spartanburg Water prevents the contamination of the drinking water supply in the event of a backflow. There are many backflow assemblies and devices available to prevent a backflow from occurring. Certain types of commercial and industrial backflow assemblies must be tested annually by a SC DHEC certified tester. The current SWS Backflow Assembly Field Test Report is available for download in PDF format. If you have any questions about the Spartanburg Water Cross Connection Control/Backflow Prevention Program for commercial, residential or any other requirements for your location, please contact Corey Reid, Cross Connection Control/Backflow Prevention Program Coordinator, at (864) 598-7203 or email ccc@spartanburgwater.org.